Florida builder Chadwell Homes needed a web site to which they could add new communities, homes and renderings without needing design or technical assistance. They liked the design of their website, but it was too complicated to manage on their own. 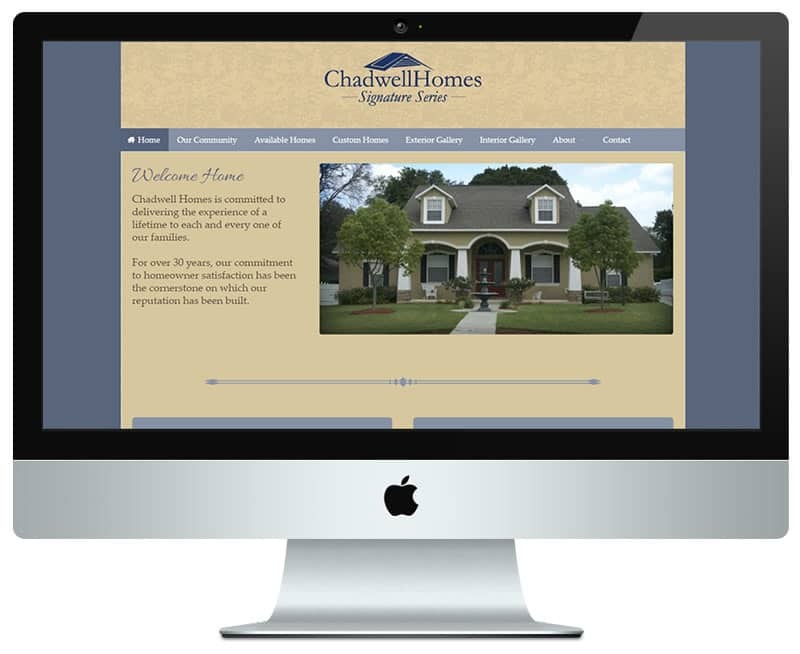 Each time Chadwell needed to update content related to key business areas, it required one person to create custom images and another person to format the layout using HTML and CSS. Furthermore, the desired output was not ideal: the site had technical debt that needed to be modernized and it was too costly to keep it as it was. Our main goal was to implement intuitive functionality to empower web site updates from within the company. We used custom content types through WordPress and turned this web site into a web application, which our client is in complete control of publishing. A few key features to store and manage data elements have been outlined for the web site: Communities, Available Homes, Elevation Renderings and Galleries (Interior and Exterior). We designed the views around the data elements so content can be updated without a web designer or developer. This unique home builder web design looks great and works very well. What makes this a web application? The power of this system is with post association. There are three main content areas that can be associated with one another: communities, available homes and elevation renderings. Enter a new home to the web site, associate it with a community and it displays on the community page. The same applies to elevation renderings: enter new content, click a box to associate it with other content types and the views take care of the display by formatting the content automatically. This simplifies the process of creating well-formatted and consistent web pages by using data entry screens. No HTML, CSS or custom design work required, because the pages are all interconnected intuitively. That's what makes it a web application. We've referenced a "call-to-action" a few times in this portfolio. We want site visitors to do something next when viewing a page. This makes it easy for them to contact Chadwell homes if they are interested in a community, available home or elevation rendering for building a custom home. This call-to-action is connected to a custom form that passes the page details directly to Chadwell. This key integration increases online conversions. The site has two photo galleries to showcase interior and exterior features of the homes they build. It is a great example of a home builder web design application.